The genus name Achillea derives from that of Achilles, the hero Greek legend, who was taught herbology by the centaur Chiron. Achilles is said to have used yarrow to staunch his wounds during the Trojan War. The species name millefolium is Latin for "a thousand leaves." The common name yarrow derives from the Old English name for the plant, gearwe. Yarrow, a perennial native to the northern hemisphere, thrives in partial shade to full sun with welldrained soil. It does best with low to moderate watering, but it can tolerate drought better than most plants. It grows from 1 to 3 feet tall on an angular stem. The alternate leaves have a feathery appearance, are 3 to 4 inches long, and clasp the stem at the base. The aromatic, hermaphroditic flowers are five-petaled rays that can be white to pink to pale purple, look like miniature daisies, and grow in flattened terminal loose heads. Added to a compost pile, yarrow will accelerate its breakdown. When grown in the garden, it helps other plants nearby be more disease resistant. Yarrow opens the pores, purifies the blood, soothes inflammation, circulates chi, regulates liver function, relaxes spasms, strengthens the venous system, and calms the nerves. It also helps relax peripheral blood vessels, thereby improving circulation. Drinking yarrow as a hot tea increases body temperature and produces sweating; drinking it cold has more of a diuretic effect. A classic tea to relieve the symptoms of colds and flus is prepared from yarrow, peppermint, and ginger. Yarrow is used in the treatment of amenorrhea, anorexia, Bright's disease, catarrh (due to allergies), chicken pox, colds, coronary thrombosis, cystitis, diarrhea, dysentery, dysmenorrhea, dyspepsia, eczema, fever, flatulence, flu, hay fever, headache, hemorrhage, hyperacidity, incontinence, indigestion, irregular menses, jaundice, leukorrhea, measles, menorrhagia, nephritis, pneumonia, postpartum hemorrhage, rheumatism, stomachache, typhoid, tuberculosis, ulcers, urethritis, and varicose veins. Topically, yarrow is an excellent herb to promote tissue repair. A poultice of fresh leaves helps stop the bleeding of wounds, and fresh leaves placed in the nose will stop a nosebleed. Yarrow also can be prepared as a compress to treat blood blisters, hemorrhoids, migraine, toothache, and varicose veins. A steam inhalation of yarrow treats asthma and hay fever and is useful for clearing up oily or blemished skin. Yarrow can be used as a wash for acne, blemishes, oily skin, and eczema; as a hair rinse for hair loss; as a bath herb for skin complaints; as a douche or sitz bath for female complaints; and as a mouthwash for inflamed gums. The bitter young leaves and flowers are edible, raw or cooked. Yarrow is sometimes used in making liqueurs, and it is used in making Swedish beer to increase the intoxicating effects and preserve the beer. The essential oil of yarrow is used as a soda flavoring agent. Dried yarrow stalks were once used to throw the I Ching, an ancient Chinese system for guidance and wisdom. Druids used yarrow stems to foretell the weather. In medieval times it was used as a strewing herb. The herb is sometimes used to flavor tobacco and as a snuff. A yellow and green dye can be made from the flowers. The blue essential oil distilled from yarrow is used in cosmetics as an anti-inflammatory agent. In folkloric tradition, holding yarrow over one's eyes is said to enhance clairvoyancy. Putting some under one's pillow is said to bring dreams of one's true love. 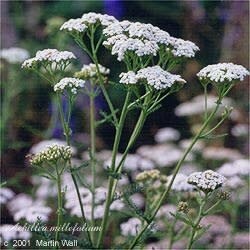 And hanging yarrow over the bed of a married couple is said to ensure their love for at least seven years. Overuse may cause skin photosensitivity, dizziness, and headache in some people. Rare individuals may be sensitive to yarrow and experience dermatitis after use. Avoid yarrow during pregnancy.